Posted on May 27, 2015 by Anastasia R.
With Sharemoney, it is now easy to receive remittances from the United States even if you are living in another country. Sharemoney supports the Philippines and the Filipino community and we offer a platform where Filipinos can send money easily from the US to their loved ones back home. Learn more about how you can enjoy such services if you are Filipino! Filipinos are widely known for speaking English fluently as their second language. However, we want you to know that you and your cultural heritage are highly valued by Sharemoney, so we have added in an option for you to change the site language to Filipino if you wish. When you arrive at our website, simply look for the dropdown menu at the upper right hand corner of the site where the words ‘EN’ appears. From there, you can click on the word ‘Filipino’ on the dropdown list. Once you have clicked that, the site language will be changed to Filipino language just as you have requested. 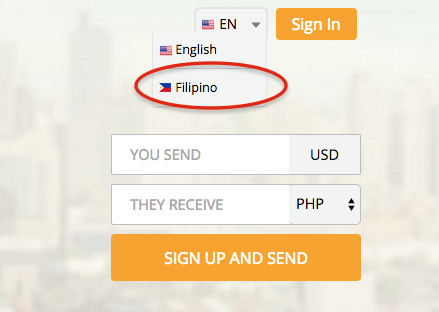 Sending money from the US to the Philippines is a breeze with Sharemoney. Our money transfer services can reach your recipients as quickly as 2 minutes and up to 48 hours depending on the delivery method you select. As the sender, you can track your funds in real-time by going to “My Account” and viewing your Transaction History. Your recipient can track the funds you have sent by simply using the ‘Money Transfer Number (MTN)’ Tracker on the site’s homepage. Recipients do not need an account to use this feature and track their money remittance. You can start enjoying Sharemoney services after creating your account. This is totally ‘libre’ (100% free). Once you have created your account, you will then be asked to verify your phone number and email address. From there, you can now start sending money to your recipient. Remember to click on the site language for your ‘kuwarta padala’ (money transfer). When you use Sharemoney to send money to your recipients, make sure you inform them on how they can claim the funds. They can receive the money in one of these three ways: bank deposit, home delivery or cash pickup. This is of course decided by you as you have already indicated the preferred delivery option during the transfer. One of the key features in Sharemoney services is the QuickSend option. This option will allow you to send money to the same person again without actually keying in their personal and account information in the process. Once you have keyed in and saved a recipient’s information by sending money to that individual, the site saves it for future use. That will make resending money a whole lot easier the next time! Sharemoney is proud to serve our Filipino money senders and recipients. If you have more questions on our services, don’t hesitate to check out our FAQ page for money transfers to the Philippines.